In a move that will make all TV addicts of my generation immensely happy, Nickelodeon has announced that it’s going to start re-airing popular shows from the 90s on TeenNick. So far, their bringing back Clarissa Explains It All, Rugrats, Kenan & Kel, Pete & Pete, The Amanda Show, and All That. So far, no word on Are You Afraid of the Dark?. (Really, what is the correct way to end that sentence? Should it really have a question mark and a period next to each other?) Since the shows are set to air in the wee hours, it’d be perfect. You know, Midnight Society. Also, how about GUTS? For readers who don’t know, it is one of my dearest ambitions to own a piece of the glowing rock, the Aggro Crag. So, if you ever see one of eBay (and I don’t think that’s ever happened, trust me, I check), let me know. Want to know more? Entertainment Weekly has the original story, but everyone’s been linking to it. Quirrell would not have been afraid of one of these trolls in the dungeon. But, I'm guessing that he'd be scarded of one of the teen girl ones. In other 90s, news, Trolls are back! But, their all skanky (Grrr, apparently WordPress does not recognize skanky as a word…) and, to use Today’s language, tarted up. 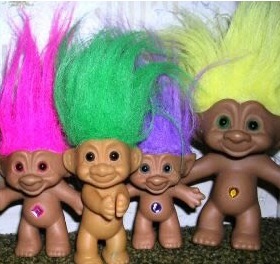 New Trolls look like teen girls in tiny clothing with very strange eyes. And, of course, the crazy hair. (No idea about jeweled belly buttons yet, strangely the skimpy clothes cover those.) For a side-by-side of the new and old models, check The Hairpin. And, visit Today for a gallery of a bunch of recently tarted up toys.